1st of May Demonstration: A city for the people. Not a playground for the rich! Affordable housing is being demolished on a large scale. A growing number of people cannot find affordable living space. The city is slowly turning into a space where most people don’t seem to be welcome anymore. Many people find themselves in precarious housing situations; those who aren’t rich are being pushed out to the city’s peripheries or beyond. This happens in a process that works as a silent killer. Streets and neighbourhoods are filled with pop-up stores where hip entrepreneurs can kick-start their business with relatively low rents. Although this may sound attractive, it only happens in order to financially upgrade a certain street or neighbourhood. Once the neighbourhood is attractive enough for investors, low-income housing will be replaced with unaffordable homes and exclusive businesses. The local residents will be driven out of their neighbourhood; what remains is generic elitism. Because of this process, known as gentrification, rents rise dramatically while people’s incomes remain the same. This increases the gap between the rich and the poor. Small shops and socially accessible spaces will also disappear to give way to exclusive shops, hotels and cupcake shops. If we don’t stop this process, the city will be turned into a playground reserved only for the rich. The city should not be an instrument for endless profit making, but a place where people should feel free and where everybody should be able to maximally develop themselves. The process of gentrification is a textbook example of a system that only works in the interests of the very rich. An exploitative capitalist system which puts profit above and before people. If we want an equal city in which everyone has a place we need to fight capitalism as well as gentrification. That’s why we will take to the streets on the 1st of May. The 1st of May is the day when people over the entire world take to the streets to demand an equal world without exploitation and capitalism. In The Hague we will raise our voices against the push-out of people with less money from the inner city. Because the city belongs to us all and we’ve had enough of elitist building projects. 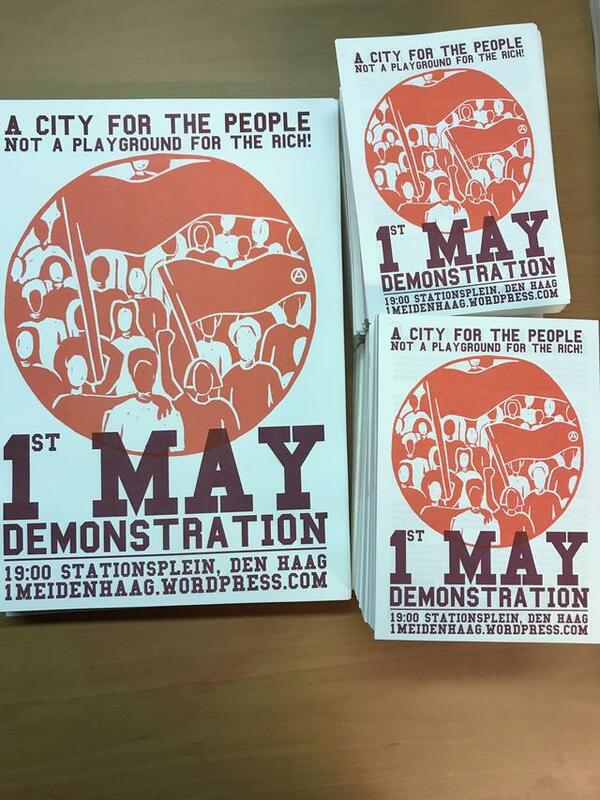 Come to the 1st of May demonstration in The Hague.